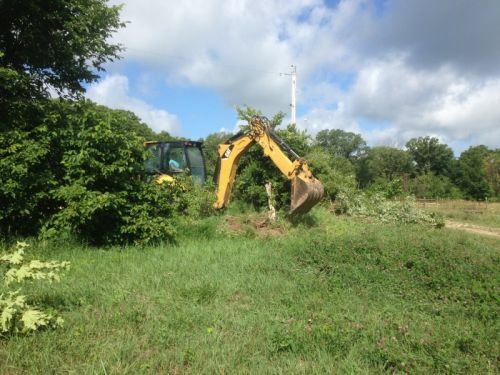 In January 2016, our journey to relocate our farm began when we purchased a 25-acre parcel of Certified Organic farmland and timber near Chillicothe, IL. 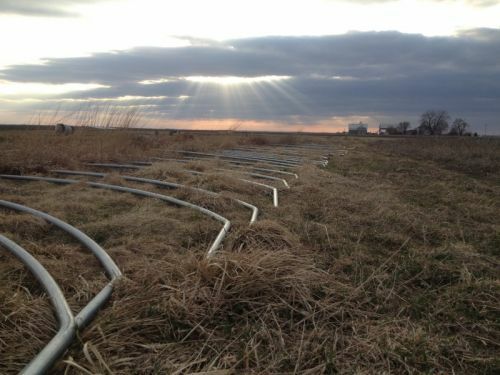 This new location is approximately 12 miles from our Wyoming farm. 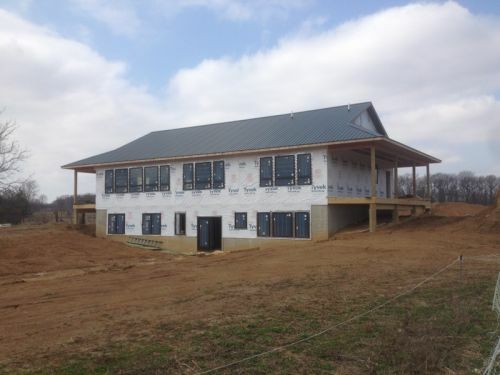 Our new farm is picturesque with plenty of timber, rolling landscape, pond, pasture and room for building a passive solar home. 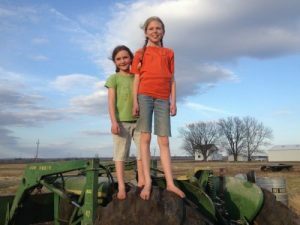 Above all, we will no longer struggle to protect our family and food from conventional agriculture. Our strong desire to live, work and produce clean food inpeace with no confrontations from pesticide applicators has been a driving force to relocate. But, the move is bittersweet as we leave a garden and pastures we have farmed organically for 12 seasons. 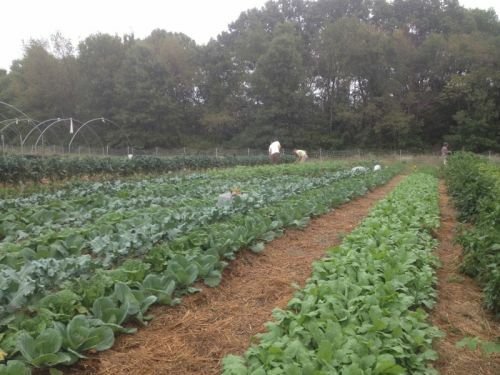 Anyone who grows food, especially organically, knows just how close the relationship is to the land that grows your food. 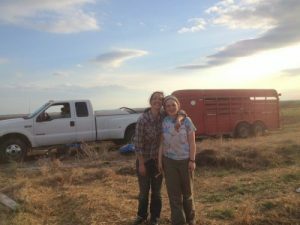 We share the following words and pictures of our transition to our Chillicothe farm. 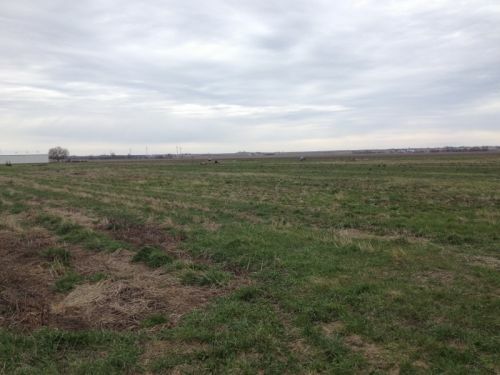 Our new farm was purchased in January 2016 and we sold the Wyoming farm ground shortly after. 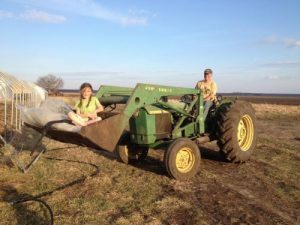 Our challenge was to break down the entire garden and pastures including hoophouses, fences and all the STUFF by the first week of April. 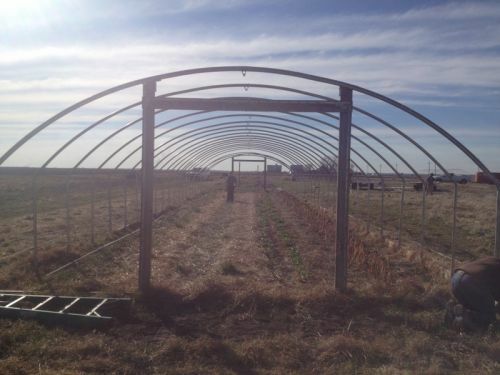 Then, move it all to the new farm, set it back up and be ready to deliver CSA Shares by the second week of June. 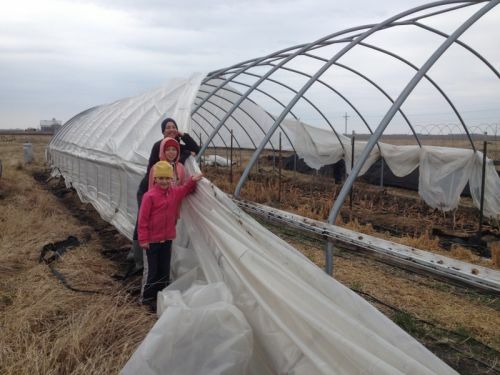 Deconstruction of our three 20′ x ’96 hoophouses began March 7. Angie, Susannah and Laura help remove the plastic from our west house. The month started out cool but temps warmed and remained mild and dry the entire month. We were so fortunate to have good weather. Susannah and Laura show just how warm it was on March 8. Shorts and barefoot! 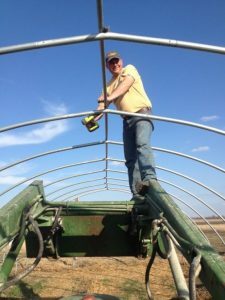 Brian begins taking the metal down on one of the hoophouses – the cordless drill is our best friend for the next several days. Gorgeous weather continues and Laura gets a lift from her Dad. We were so lucky to have the best help breaking down the garden. Angie, Becca and Lucy gave us so much time. Susannah and Laura were also big helpers. There was ALOT to do by April 1st! Our help is gone for the day and the clouds have moved in. But, then the sun started peaking out. The dismantled hoops from our hoophouses are laying on the ground and our homestead is off in the distance. As our time in this garden begins to wind down, these pictures in the garden looking west with our homestead in the background are short lived. We’ve enjoyed this view many times over the last 12 years. 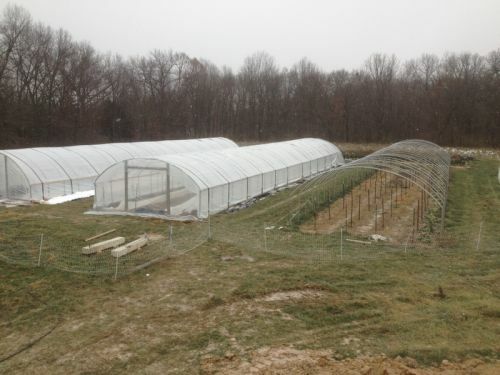 March 11 is another sunny warm day and we’re breaking down the last hoophouse. You can just barely see the last greens that have overwintered in this house. Spinach harvested from the hoophouse in the picture above. 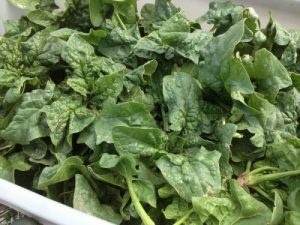 Overwintered spinach is the best, sweetest leaves of the year. We’re keeping these leaves for the family. 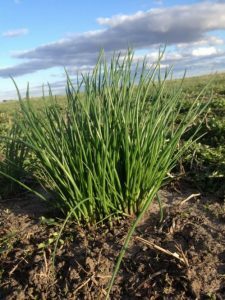 We saved what we could before the ground changed hands including several clumps of these glorious chives. The day we dug these up was as good as it gets – warm, sunny, gentle breeze. And, being surrounded by these beautiful plants just added to the day. We dug up several clumps to tranplant to our new garden but had to leave some behind. April 5th and the Wyoming farm is nearly bare except for a couple hog waterers and a feeder off in the distance. No more hoophouses. This picture shows just how open it is at this farm. This is wide open prairie and we have learned just how difficult it is to grow food in an area where the wind effects every decision we make. 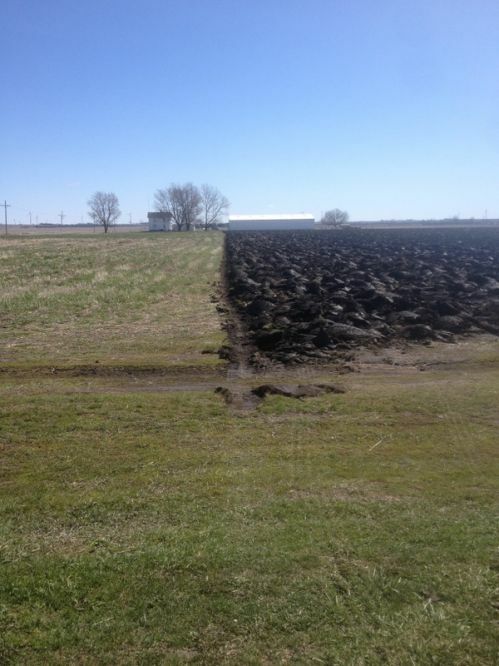 April 9th and the Wyoming farm ground has officially changed hands and it is being plowed under. 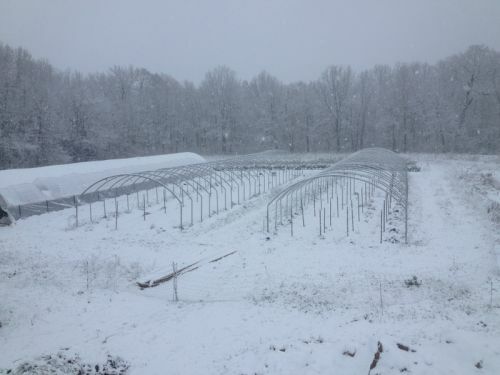 Here we are looking at the portion plowed on the right and the remaining untouched garden on the left. 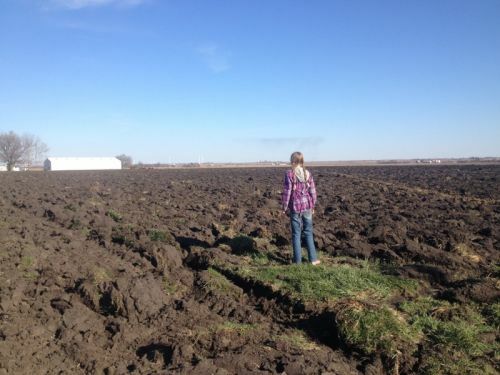 We arrived home from a Naperville Spring Market that same day to see the Wyoming farm plowed. Susannah stands and looks out over what she has always known to be our garden and pastures. It is quite a sight. Now, we turn our full attention to the new farm. 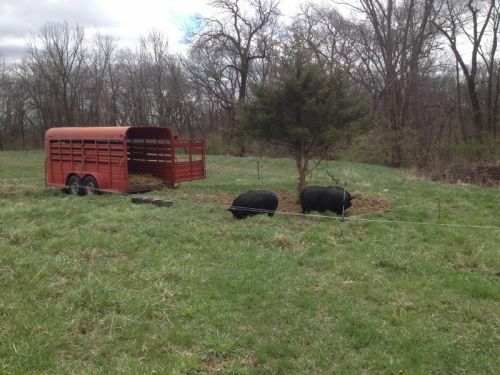 We’ve relocated the Guinea hogs to the new farm and they are loving the forage. The livestock trailer makes a great temporary movable shelter. 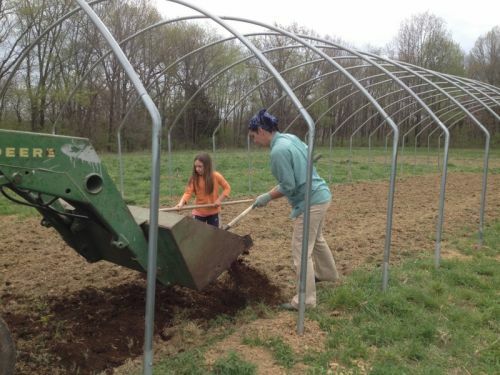 We work hard in April 2016 to get our hoophouses up and get seeds and plants in the ground for our CSA beginning in June. 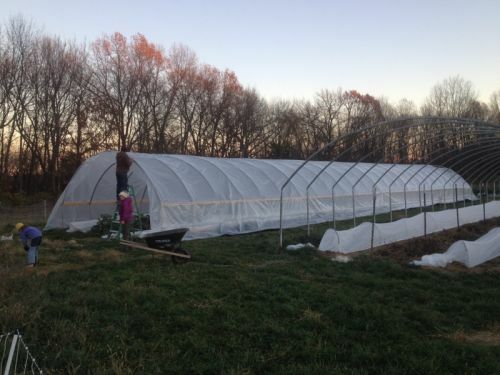 We are only concerned about getting the the hoophouse frames up and then planting the area inside. We will not cover the houses in plastic right away but we do want the ability to pull shade cloth when it is too hot. Becca and Laura (8) spread compost on our beds to prepare for planting. 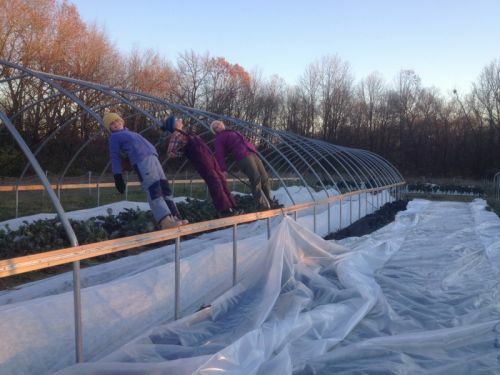 First week of May and Lucy, Susannah and Laura knock out the first bed of broccoli and cabbage transplants. 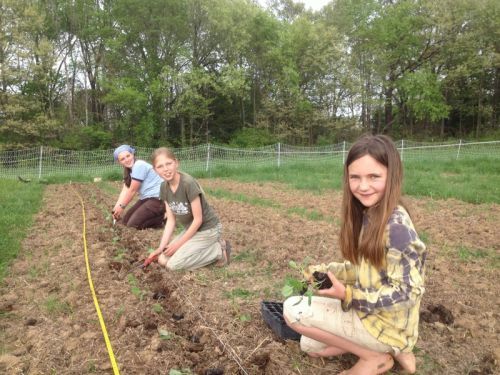 Our new garden is now limited to 100′ rows and these 3 experienced organic farming kids can plant a bed this size in no time. Late May and the greens are growing. 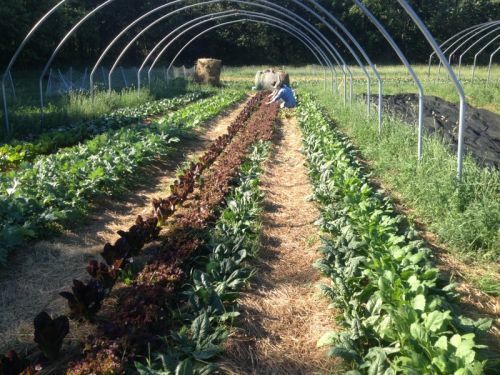 CSA deliveries begin in a couple weeks. Lucy shows off perfect spinach leaves. It’s coming together. 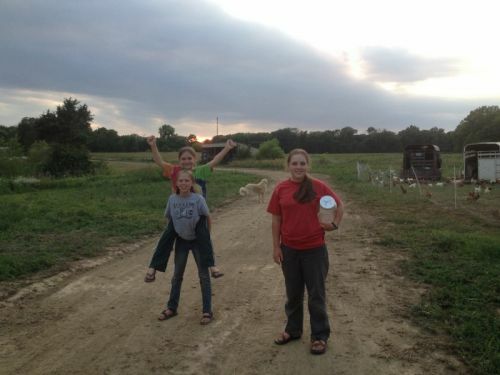 We also move the first flock of Freedom Ranger meat chickens from home to the new farm. We’re nervous about predators at the new farm. We love our trees you see in the background but that also means owls, hawks and more. 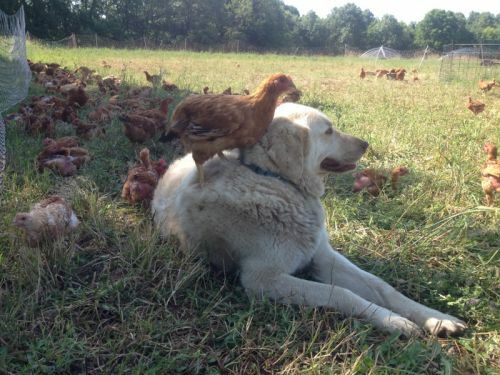 Bella, an Anatolian Shepherd, will keep watch over these chickens. And, we’re off! 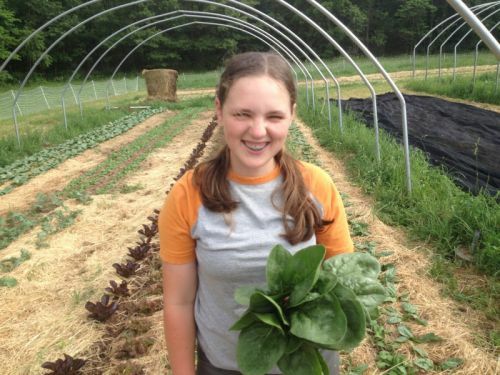 Our farm crew harvests beautiful greens the day before our first CSA delivery. All the hard work paid off because the food is gorgeous. 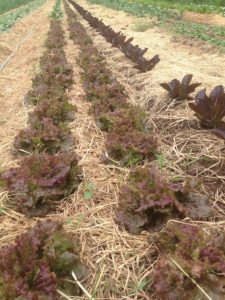 June is hot and the tender greens need shade. We are glad to have hoops in place. 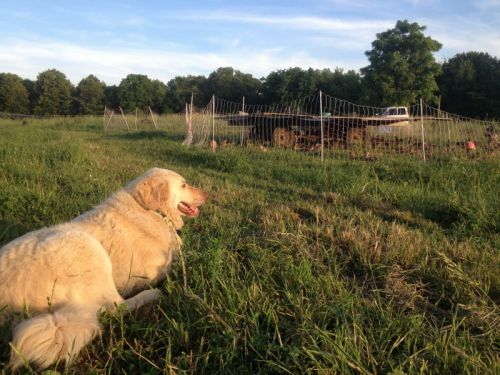 Bella does a fine job of guarding the meat chickens. What a good dog! 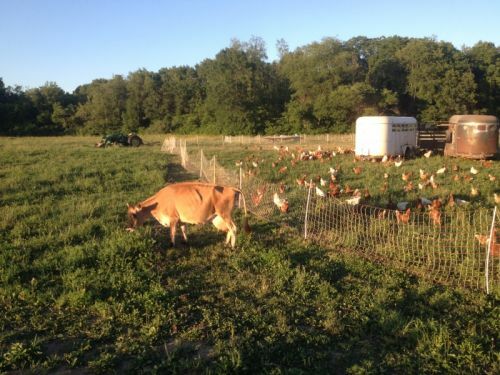 Gorgeous evening in June with content laying hens and our Jersey cow, Bonnie. Early July and we get help putting in the driveway. 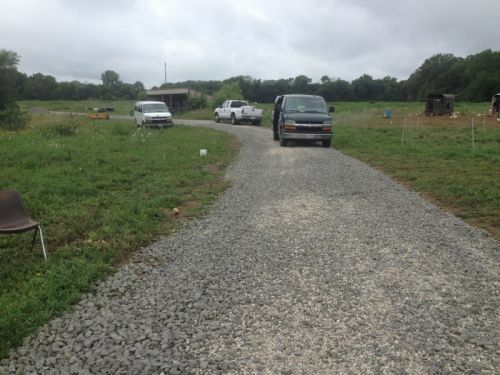 Gravel gets trucked in to finish the driveway. Now, finally, we can drive onto the farm come rain or shine. 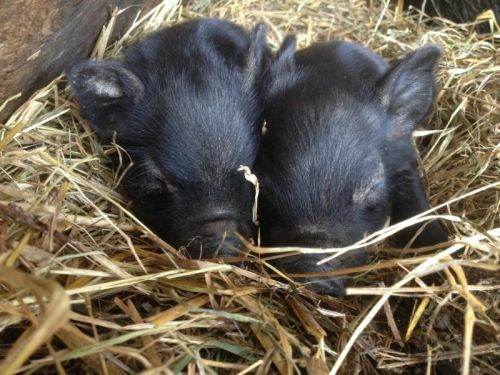 On August 16, we welcome new baby Guinea hogs at the new farm. One boy, one girl. They are so cute! 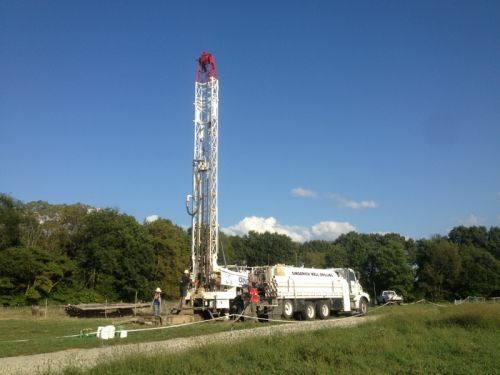 Late September and our well gets drilled. These guys come late afternoon and stay until almost 10 p.m. After dark, their rig is lit up like a stadium. BIG DAY! 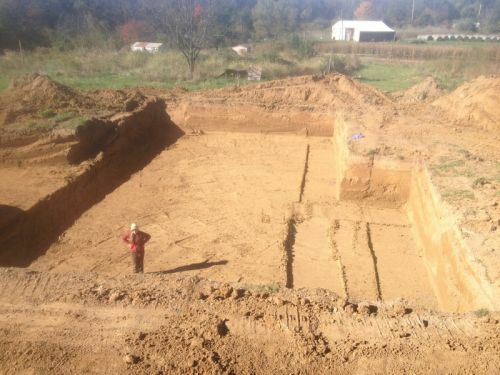 The foundation is started on our new home. Susannah and Laura are glued to the process and it reminds us of a favorite children’s book, Mike Mulligan and His Steam Shovel. Just like Mike and Mary Anne, our fella finished before the sun set, walls straight and square. Amazing! 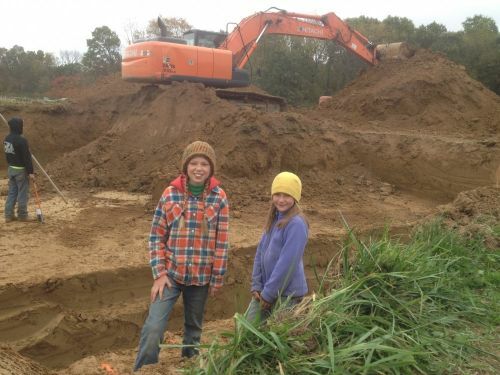 The soil from the foundation makes a huge pile – great for taking pictures. Here, we’re looking down at Lucy standing in her future new room! The fall garden looks great! Cabbages, broccoli, turnips and more. The fall weather is mild. We’ve had a very mild fall but we have to get our hoophouses covered. 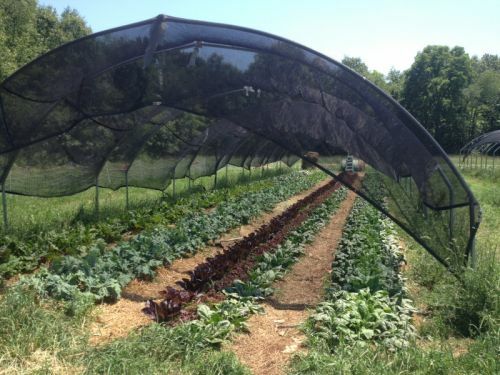 We’re running out of time to get our fall greens protected from the weather. Here, the girls horse around before the real work begins of attaching a new sheet of plastic to one of our 20′ x 96′ hoophouses. Plastic is pulled over and now we wire it down to the structure. December 4th and we receive our first snow fall. Still need to cover the middle hoophouse. e winter. Cold weather hits us not too long after this picture is taken and temps dip down to single digits. The house is taking shape. You are looking at the north side of the house. 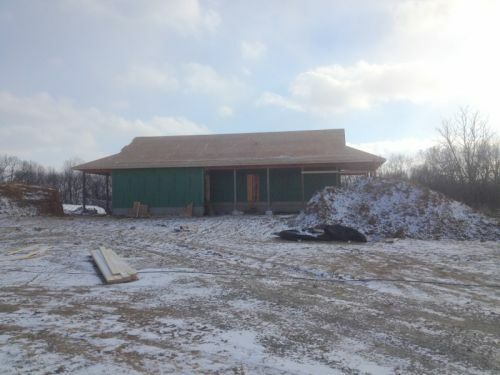 This will be a passive solar home and the south side will have several windows to harvest the sun’s warmth in the winter. Extra insulation will help keep our home cool in the summer and warm in the winter. Our move means we are moving everything – including the material for compost. 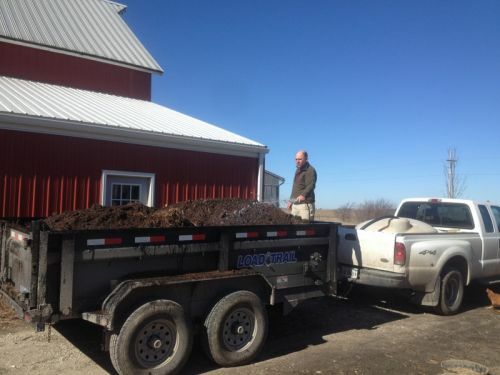 We rented this trailer to move unfinished compost from the old to new farm where it can be turned and finished to use on the garden beds. Temperatures soar to the mid-70’s and the hoophouses feel like summer inside. 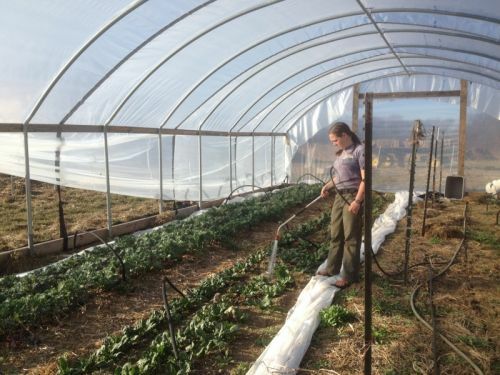 Lucy is watering spinach – notice short sleeves and sandals. In February! Crazy warm! 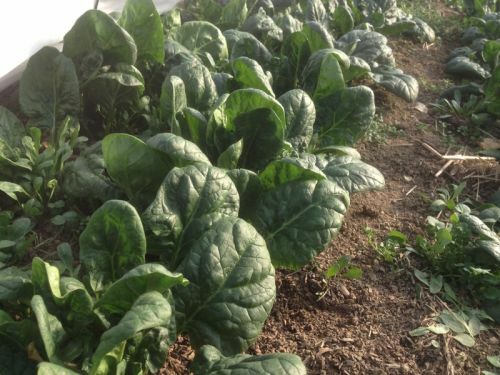 The mild temperatures put fantastic growth on this overwintered spinach. Absolutely gorgeous! 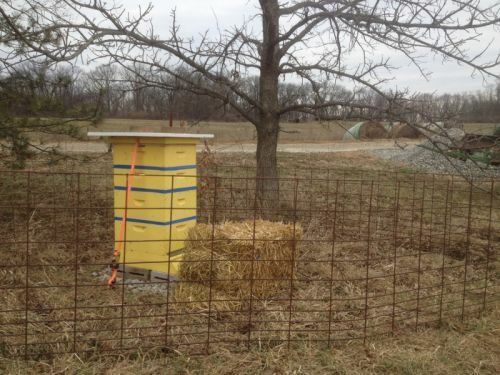 Early March and we are very fortunate to welcome honey bees to the new farm. Friends who had to move away gave us this bee hive. Our new farm is a perfect location for the bees with protection from harsh winds, pesticides and lots of food for these bees.